Whoa, who sneaked those 3d glasses on me. There must be some kind of ninja in here because I didn't even notice I was wearing glasses until I opened that card and WHAM baby that picture just popped right out of the card toward my giant eyes. Wait a minute, I don't have glasses on. That means that it really did pop-up out of the card at me. That was amazing! pop-up greeting cards are now officially my favorite kind of card craft for kids. The ideas are just flooding into my brain about all the different types of pop-up card crafts I could make. Something with a cuckoo or turkey would definitely by great and I bet all of the major holidays could do with some pop-up card action. You could pop out a heart for a valentine pop-up or a Christmas tree for, well Christmas of course. So don't bother with 3d glasses, just make some pop-up card crafts for kids right away! If you want to make a pop-up card for Easter, then you will be interested in the following craft. There are 3 parts to this card...the chick, the grass, and the card that he pops out of. Just cut them out, glue them together, let them dry, and then personalize your card. This is a great start-up beginner's pop-up card making craft for you. 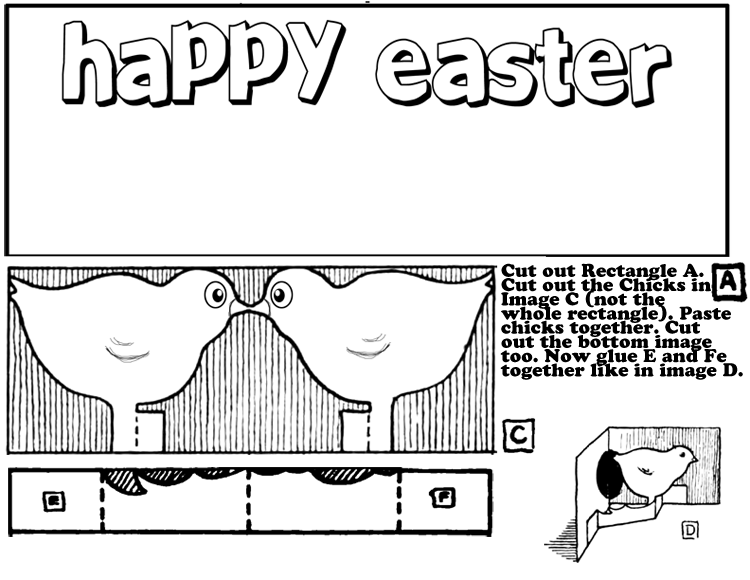 If you want to color-in your Easter Card, then you will want the black and white version. 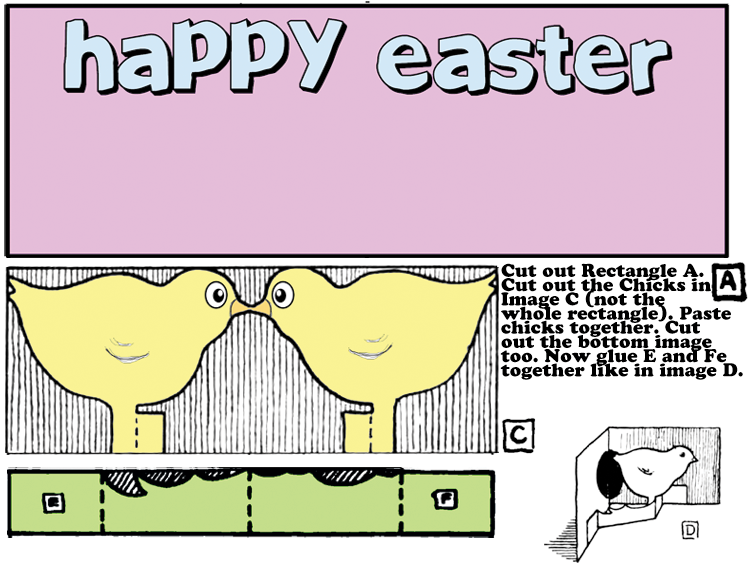 If you want to use your color printer to print out the Easter card, then the color version is for you. Black and White Version ... Color Version. Open up The window and then print it out. How to Make Valentines Day Pop Up Card of Girl Hugging Heart Crafts Idea for Kids - Today, we will show you how to make this really cool Valentine’s Day Pop Up Card craft for kids. Learn how to fold and cut paper to make a pop-up card with a girl hugging a Valentine’s Day heart. People will love receiving this card…so learn how to make it. Pop-Up Easter Eggs Sitting in a Nest Card - This is a basic pop-up card. The bird's nest pops out at you so you can fill it with paper Easter Eggs. It turns out really well and would be great to try out for Easter time. Thanksgiving Turkey Pop Up Card Making Craft : Turkeys Beak Opens and Closes - This is a unique Turkey pop up card in that this one has an open and closing beak. My kids said that it is the coolest pop up card that they have ever seen, so I decided to share it with all of you nice kids and parents. Pop-Up Placecards - Learn how to make these pop-up placecards...that can also be used as pop-up birthday cards. Accordion Fold Victorian House Pop Up Card - -In this tutorial you will learn how to make a pop up card of a Victorian house. Angel POP-UP Card - - Let me show you how to make an Angel POP-UP Card for your Christmas....sending a DIY greeting card is always better than buying a real card from.pngt shop or or just sending an e-card. because your friends won't throw it aways and keep them for a long time. Another Butterfly Pop Up Card - - This one is a little more complicated. The pop up mechanism is interesting in that the butterfly makes a 90 degree, counter-clockwise turn as the card opens. A vibrant pop-up heart card for your sweetie on Valentine's Day - - A handmade card is a wonderful way to say “I love you” on Valentine’s Day. This classic pop-up design is embellished with vintage images of cupid and a loving couple, and some specialty papers. Easy enough for kids to make! Bird Beak Pop-up Card - - Make a Bird Beak Pop-up Card. When you open the card, the beak opens! This is a very easy project and a lot of fun. Beautiful DIY Pop-up Cards - - Last month, my best friend took me out to lunch for my birthday. She gave me one of the most unique and beautiful birthday cards ever. Surprisingly she told me she made it herself. Now she has always been a "crafter,” doing lots of fun projects, but this card was different. *So I asked her what inspired her? She smiled anticipating the question, knowing I would be impressed. She told me that she actually downloaded the pattern she bought online, after seeing a video on YouTube. I was excited. Cards That Make You POP! - - I learned how to make fun pop-up cards in college. It is a fun way to really make your card pop out. Cast Photo Pop Up Card - - This is a Thank You variation of the theater pop up card. The original design has a cast photo that pops up through a slot in the stage floor. I like the mechanism, but the photo is quite small and it's hard to see the kids' faces. Chanukah Craft: Pop-up Dreidel Cards - - Make pop-up cards, pop-out decorations, or garlands with these dreidel patterns. Christmas Crafts - Pop-Up Card - - Learn to make this pop-up card from this tutorial. Christmas Craft Pop-Up Card - - Christmas is a time for family and friends to enjoy each other. What better way to do that then to do a Christmas Craft together? Children really enjoy making Christmas Crafts with an adult. These Christmas craft ideas can be used by individuals or by groups. Also the best.pngts are the ones that are hand made. A great Christmas idea is to help a child on your list to make a Christmas craft they can give as a Christmas.pngt. Christmas Pop-up Cards - - Put your imagination to work as you explore through your scrapbooking supplies or craft store for ideas. This method gives a polished professional look to your work and you will be the envy of all your friends as they wonder how you did it. Christmas Tree Pop Up Card - - Everybody enjoys Robert Sabuda's pop up books, now he shows you how to make your own pop ups to enjoy or give as a card to someone special. Dora's Father's Day Pop-Up Card - - Let your child express her love for Dad just like Dora does. Make a pop-up card with your little Dora fan, and the card will say it all when Dad unfolds it. Double Heart Pop-Up Valentine Card - - Teach kids how to make a valentine pop-up card. This is an easy valentine craft. Double Heart Spiral Card - - I know, I know, everyone has made a spiral card by now. But have you thought about what would happen if you made a spiral that didn't start as a circle? And what if you made two spirals, and joined them above the card crease to make a card that could open 180°? Now that's interesting. Easter Jesus Is Risen Pop-up Card - - Pop-up cards are gaining in popularity among hand-made card crafters. Here is an easy one you and your students can do. Father's Day Pop-Up Card - - This is a great card for Dad on Father's Day! How To Make a Pop Up Card - - Pop-up greeting cards are a great twist on the ordinary greeting card. They are enormously fun to create, and the recipient of your card will be delighted! Most people don't expect to see something pop out at them when they open a homemade card, so surprise that person you care about with a little skill and a lot of fun! How to Make a Pop Up Card for Children - - This video tutorial will guide you how to make a pop up card for your kids. Ideas for Making a Homemade Pop Up Card - - Ideas for making a homemade pop up card can help you create a unique and personalized greeting for almost any occasion. Pop up cards offer a fun and interactive element that appeals to both the young and the young at heart. Easy pop-up cards - - Pop-up birthday cards are fun to give and even better to receive, but the cost - $4 or more in some cases - can be prohibitive. The solution? Make your own. Homemade pop-up cards are cute, surprisingly easy to create and so much more personal than a store-bought card. Father's Day Card - - Father’s Day is around the corner. I’ve made this card for my Darling, for being the #1 Dad to my precious Ethan. I’ll make another for my Dad too, for being the #1 Grandpa to Ethan and the #1 Dad to ME! Father's Day Pop-Up Card - - Let Dad know that he's #1 with this fabulous Father's Day pop-up card. It's a fun homemade craft for kids to create. Father's Day Pop-up Card - - Learn how to make a father’s day pop up card for your day. Father's Day Pop Up Cards: Ocean Scene - - If you have been looking for Father's Day pop up cards, try out this cute ocean scene Father's Day card! It is very easy and even young kids could make it. The template for all the sea creatures is provided, so all you really need is a supply of scrapbook paper. Glittered Holiday Cards With Fold-In Shapes - - With a few basic techniques, you can create a wide range of looks by varying shapes, color, and decorative details. These snowman and snowflake pop-ups are decorated with glitter and glue, and inscribed with a fountain pen dipped in red ink. How to Make a Christmas Tree Pop up Card - - One of the first things that herald in the Christmas season is greeting cards. The shelves are stacked with boxes of varied, assorted and made to order cards, ready to be signed and mailed. Imagine for a moment how wonderful it would be to personalize your cards this year, and make your own Christmas tree pop-up card to send to those special friends and family on your list! How to Make a Holiday Pop-Up Card - - As a favor to a friend, Lynne Willis designed a wedding thank you card, which inspired her to start making greeting cards of all kinds, including this clever holiday pop-up card. Follow these instructions to make your own holiday card. How to make a Pop Up Card - - Learn how to make pop up cards. How to Make a Pop Up Christmas Card - - Christmas is an excellent time of the year to form new memories with your children while working together on a wonderful craft. Learn how to make a pop up Christmas card that will delight any child this holiday season. How to Make a Turkey Pop up Card - - Thanksgiving Day in America is a time to celebrate and give thanks, it is a time of families getting together and enjoying a holiday dinner, usually consisting of turkey, stuffing and pumpkin pie. Write the name of the family member, the date, and a few words to fit the occasion, and place on the table to show each where they will be seated. What a wonderful way to say welcome, and a great way to remember this Thanksgiving day for years to come. How to Make Your Own Pop Up Cards - - You can make your own pop up greeting cards or party invitations by using these easy instructions. Pop up cards are fun for any holiday or occasion. Hummingbird Pop Up Card - - I’ve just reviewed this pattern for Folding Trees, and here’s the hummingbird card I made. Isn’t it gorgeous? And it looks a lot more complicated to make than it really is! King Stefan's Pop-up Crown Card - - For 16 years, while a heartbroken King Stefan awaited her return, Aurora didn't realize she came from royalty. In fact, it wasn't until the good fairies finally brought the young princess back to her father's palace that she was properly fitted with her first royal crown. With this Father's Day greeting, you can be sure the king in your castle gets his due. Just open the card and up pops a bejeweled crown as regal as King Stefan's. Lattice Window Pop Up Card - - The picture in the window is from an old school book. I have a whole pile of them, with wonderful illustrations. Surprisingly, I've had difficulty incorporating them into my card making, so I was happy that this one worked perfectly. Make a Holiday Pop-Up Card - - Many people give cards during the holiday season. Cards let someone know you are thinking about them. They are also a fun way to wish "Happy Holidays!" to your friends. Make a Pop-up card - - Liven a handmade card with a surprise, by making it pop up! Instead of going to the store and buying one, you can make your own! A cheaper and more heart felt solution to cards. Make a Pop-up Card with Nesties - - I have been playing around with my large scalloped circles and discovered that I could make a pop-up card really easily. Make this Halloween Pop Up Card - - Here is a Halloween pop up card that would warm a witches, uhm, heart. Making Pop-Up Christmas Cards - - We made two types of cards. The first is a pop-up origami tree card. The second is a pop-up cut-out Christmas tree card. Making Pop-Up Valentine's Day Cards With Your Kids - - How to make Valentine's Day pop-up cards with your children; get expert tips and advice on making holiday themed arts and crafts projects for kids in this free instructional video. Max & Ruby Mother's Day Pop-Up Card - - For a heart warming Mother's Day, make this pop-up card that'll take you and your kid into Max & Ruby's world, where they have a surprise party all ready for Mom. Messy Rabbit Cd – Pop Out Tent Card - - This is the Tent pop out card with some extra tips & photos for making this card up. Mirror-Image Silhouette Cards - - Create a pop-up card featuring a pair of reindeer with little fairy-tale touches, including a patch of glitter that mimics the wintry forest floor. Mother's Day Pop-Up Flower Card - - This Mother’s Day craft is great for kids of all ages. All you need is some poster board, scissors, glue, colored paper (construction paper is best) and some felt tip pens or markers. Paper Dreidels - - Children can make pop-up cards, pop-out decorations or garlands out of this Hanukkah paper dreidel craft. Perky Pop-Up cards - - Create exciting, handmade cards with your Crayola Cutter Pop-Up Card kit. Celebrate one-of-a-kind birthdays and holidays with friends and family. Piano Keyboard Pop Up Card - - A piano keyboard is not too hard to make. It's based on the simple box mechanism. As is usual in origamic architecture designs, cut lines run vertically and fold lines run horizontally. Picnic Pop Up Card - - In this tutorial you will learn how to make a pop up card of a picnic scene. Pop-Up Birdcage Card - - The Pop-Up Birdcage Card is quite a complicated project. Though the cage is small, it’s made of many small, intricate pieces. Pop-up Bouquet Card - - Sure, long-stemmed roses may be lovely, but this pop-up bouquet is much more personal -- not to mention affordable on an allowance. Pop Up Card - - In this tutorial you will learn how to make a star pop up card. Pop UP Card - - Do you love interactive cards? Or ones that have a surprise when you open them? I do. These kinds of cards are becoming extremely popular, but they often have a hefty price tag. So I decided to make my own. Here’s the front of my card. Pop-up Card (Bouquet) - - This pop-up card features a pretty bouquet of flowers, tied with a ribbon, that pops out when the card is opened. Use it any way you want, for example, for Birthday or Mother's Day greetings, etc. Write a heartfelt message inside and send it with a present. Pop-up Card (Cake) - - A double-decker cake perfect for birthdays and weddings pops up from this card! Fruits or flowers? From these two, you can pick the design of your choice. Option: With candles and decorative stickers, you can jazz it up! Write a heartfelt message inside and send it with a present. Pop-up Card (Chocolate-box) - - This lovely pop-up card becomes a dainty little box, filled with chocolates and hearts. And, you can choose cookies to go with the chocolates, if you like. The boxes come in two colors, so you can make your own, original combinations. Write a heartfelt message inside and send it with a present. Pop-up Card (Chocolate-cake) - - This pop-up card features a chocolate cake that looks good enough to eat. Use it any way you want, for example, for Birthday or Valentine greetings, etc. Write a heartfelt message inside and send it with a present. Pop-up Card (Christmas) - - Learn to make this Christmas pop up card. Pop-up Card (Christmas house) - - Santa Claus has arrived with a huge sack full of presents, at a festive house decorated with a Christmas tree and wreath. But - uh oh! He's got himself stuck in the chimney!Experience this fun Christmas story as the house pops out of this 3D card.Why not add a handmade message card to your Christmas present? Pop-up Card (Christmas Tree) - - This pop-up card features a simple and stylish Christmas tree. Write a heartfelt message inside and send it with a present. Pop-up Card (Christmas Wreath) - - A Christmas wreath comes spinning out of this pop-up card. Decorate it with ornaments to make your own unique pop-up card. Write a heartfelt message inside and send it with a present. Pop up Card Design - - For some animal-loving-person, these pop up card might be a perfect choice. At least. that what I thought. It may be a little different from origami animal crafts since it involves a few cuttings besides folding. Pop-up Card (Happy Birthday) - - Happy birthday! This fun pop-up card features cute dogs playfully wishing you a happy birthday. Write a heartfelt message, add it to a present and send! Pop-Up Card – House - - A friend of mine will be shifting to her new house soon. I made this card to go along with the house warming.pngt. Pop-Up Cards - - Here are some creative ways to use paper, glitter, and embellishments to make pop-up cards. Pop-up Card (Santa Claus) - - This pop-up card features a lovely Christmas tree and Santa in his sleigh, being pulled by a reindeer. Write a heartfelt message inside and send it with a present. Pop-Up Card - Shark - - Learn to make this shark pop up card. Pop-up Card (Snowman) - - The snowman that pops out of this card is assembled like a puzzle.Add a scarf or mittens as you like, and make your own original snowman! Pop-up Card (Sweets-box) - - A colorful box full of all kinds of sweets pops out of this card - it's perfect for Valentine's Day! You can write your message on the space provided, or add message stickers to make your own original layout. Write a heartfelt message and attach it to your present. Pop-up Card (Teacup) - - This charming pop-up card features a stylish teacup. It can be used in a variety of ways, such as a Mother's Day greeting, or to invite a friend round for tea. There's a selection of contents and three types of cup for you to choose from to make the card you want. Write a heartfelt message inside and send it with a present. Pop-up Card (Wine) - - See a wine bottle pop out from this new pop-up card. Use it any way you want, for example, for Birthday or Father's Day greetings, etc. Write a heartfelt message inside and send it with a present. Pop-Up Easter Greeting Card Craft Project - - This two page printable crafts file has two crosses and two sets of cut-outs for two cards. You will need to print the sunrise background twice to make two cards. Pop-up Father's Day Card - - Learn to make this father’s day pop-up card. Pop-Up Flower Card - - Make this creative flower pop up card for your mom this mother’s day. Pop-up Flower Garden Card - - Make a beautiful flower pop-up card using construction paper. This is a great Mother's Day, Spring, Get Well Soon, or Birthday Card. Pop Up Graduation Hat Activity- - This card is dedicated to my wonderful students. Pop-Up Greeting Card with Easy Directions - - Make a card with windows that reveals messages and pictures. Pop-Up Greeting Cards - - These cards are very easy to make. Print "Block Type" with a thin outline across the fold. Pop-Up Greeting Cards - - OK, it's not exactly the best job practice, but somewhere, in an alternate universe, it is perfectly fine to kill time at the office by making some of these fantastic pop-up cards. Pop-Up Greeting Card Tutorial - - Josie’s really been into making pop-up cards. She’s always creating bits of love for each member of the family but this has really caught her fancy, and I can see why. It is just such a simple and effective little project; so easy a five year old can do it! Pop-Up Heart Card - - Pop up cards are so cute and add that little extra. And the great thing is these are fairly easy to make. Pop-Up Holiday Card Activities for Kids- - Nothing says "You're special" this Christmas better than a pop-up holiday card with wishes from the heart -- especially since the "pop-up" is always a delightful surprise! Pop-Up Thank You Cards - - It was a design for a whale card. But, you could use it with just about any character. We chose to use pictures of the tiny person wearing some of her new gear and playing with her new toys, personalizing them depending on the.pngt to be thanked for. Pop-Up Valentine - - This clever pop-up valentine is designed so that when you open it, the two people kiss. This is a unique way to say, "I love you!" Pop-Up Valentine Card to Make - - Here's a quick and creative way to show off your Valentine sentiments. Pop-Up Witch Craft with Easy Directions - - Surprise! Whether it's a witch, black cat, or ghost, these cards will be pop-ular with family and friends. Pumpkin Pop Up Card - - This quick and easy Halloween card is perfect for young crafters to make for friends and family. Rediscover The Pure Pleasure Of Paper Crafts And Pop Up Cards - - The experience was extremely rewarding and I think everyone should do this sort of non-digital creative work on occasion to jolt your thinking a little. Here are some general pointers on how you can go about it for best results, along with the story of my pop up card about ‘home’. Reindeer Pop-Up Card to Make - - Spread holiday cheer with this one-of-a-kind holiday card. Seven Flower Pop Up Card - - I know I say "amazing" a lot, but this really is the Amazing Seven Flower Pop Up! Spiral Pop-Up Card - - Create this fun pop up card in a few easy steps. Sweet 16 Birthday Pop Up Card Making Instructions - - This card has a fascinating pop up mechanism. The two outside candles fold forward toward the cake and the two inner candles fold backwards toward the 16. When it collapses you can't believe the candles can possibly fit inside the cake! Thanksgiving Turkey Pop Up Card Making Craft - - Free Thanksgiving Pigrim & Turkey Activity Game : Make Printable Foldable Pilgrims & Turkeys Thaksgiving Tic-Tac-Toe Paper Crafts Game for Kids. Thanksgiving Card - - Transform patterned paper into wonderfully personal greeting card. One creative way is to make both folded card and pop-up. Valentine's Day Pop-Up Card - - Looking for a special Valentine's Day card? It doesn't need to be storebought to be special. Try making your own Valentine's Day greeting -- your loved one will surely appreciate your thoughfulness. Valentine's Day Pop Up Card - - Kids as young as seven can make this pop-up card using the patterns provided. Valentine ‘s Pop Up Card - - Adapted from this design posted on Craftster. This is how it came out.